Very few universities have a living mascot. Most settle for a figurative representation of their mascot by dressing up a spirited student in a costume who is present at athletic and school-related events. Louisiana State University (LSU) has a different arrangement. The LSU mascot, Mike the Tiger, is a real Bengal tiger. While the mascot you see at LSU football games is just a student in a costume, the real Mike lives in a tiger habitat on campus, overseen by the university’s School of Veterinary Medicine. 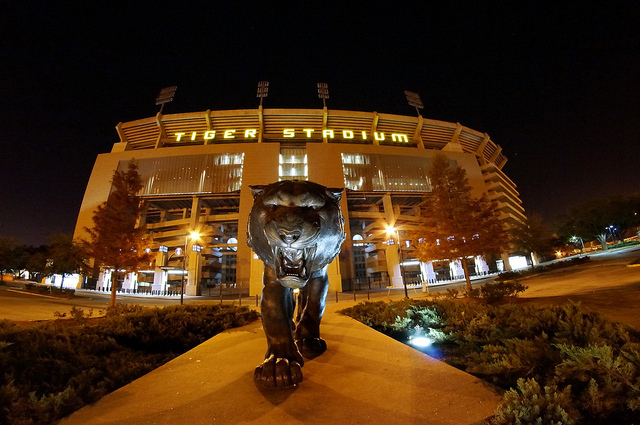 Mike the Tiger first arrived on the LSU campus in 1936, after athletic department members Chellis Mike Chambers, T.P. Heard, William G. Hickey Higginbotham, and LSU law student Ed Laborde decided to bring a real tiger to LSU. They requested donations of 25 cents from all students in order to raise the funds to purchase the tiger (LSU no longer purchases tigers and only accepts rescues). The fundraising campaign was a success! With the $750 raised, they purchased a 200-pound, one-year-old tiger from the Little Rock Zoo. 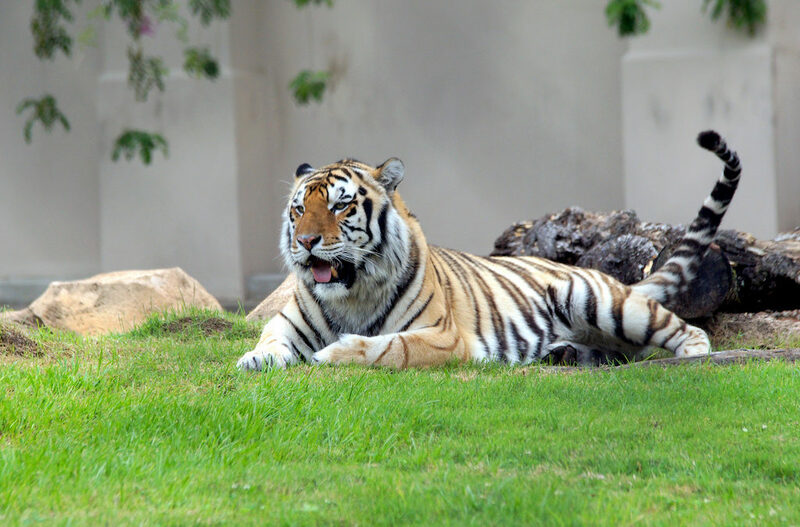 The tiger was originally named Sheik, but his name was changed to Mike in honor of Chambers, the man most responsible for bringing him to LSU. For nearly 20 years, Mike I represented LSU, traveling with the team and serving as the mascot. He died due to kidney disease on June 29, 1956, but created a legacy that continues on in LSU athletics and school pride. He was succeed by other rescue tigers, with Mike VII currently filling the role. LSU stopped purchasing tigers to fill the role of mascot after Mike III in 1958, and instead began to take in rescues only. They want others to realize, as they did, the problems associated with irresponsible breeding of tigers sold into captivity. By providing a home for a tiger that needs one, LSU hopes to raise awareness about the protection of tigers, both in the wild and in captivity. Mike the Tiger lives in a 15,105-square-foot, USDA-licensed habitat. The comfort and care of Mike is a high priority for the LSU School of Veterinary Medicine, so they conduct annual inspections to ensure the habitat meets all Animal Welfare Act and USDA policies and guidelines. The habitat incorporates natural substrates, including grass and ponds, along with elements of LSU’s renaissance architecture. Educational facts about Mike are posted around the habitat so visitors can learn more about Bengal tigers. LSU tours provide opportunities to visit Mike’s habitat on North Stadium Road. For more information, visit the official Mike the Tiger website. Mike VII arrived on the LSU campus on August 15, 2017 at 11 months old. The rescue tiger was donated by the Wild at Heart Wildlife Center in Okeechobee, Florida. He eats 20 pounds of food daily, totalling 140 pounds a week, to maintain his growing needs. He is tended to by his own personal veterinarian from the LSU School of Veterinary Medicine, Dr. David Baker, and his care plan is USDA certified. Other specialists and students at the veterinary school also assist with Mike’s healthcare needs. Mike the Tiger is not at all camera shy, so you can get plenty of photo and video updates about him on social media! You can also watch live footage of Mike on the Tiger Cam.